Ceramics, that will be analyzed by Natalia; ground stones, in charge of Rodolfo Parra; flaked stone and figurines, which will be classified by Jonathan; special artifacts, analyzed by Natalia and Jonathan and finally miscellaneous, analyzed by Natalia, Rodolfo and Jonathan. 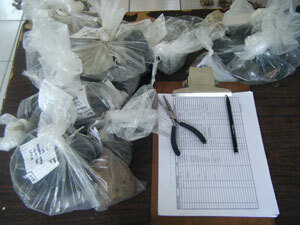 In order to register and count the materials correctly, we separate them in different categories. The ceramic analysis consists in the typological identification based on the characteristics (paste, shape, decoration) contained in the fragments recovered. Eventually, we will compare the results with artifacts from surrounding areas in order to be able to establish a chronology. Here we can see some ceramics already classified in different types. 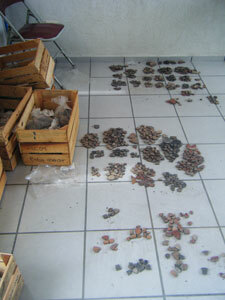 The analysis of lithics (flaked and ground stones) will be undertaken using the operational sequence methodology. Basically, this kind of analysis takes into account the whole process involved in producing stone artifacts (raw material procurement, manufacturing technology, use, and discard). Within the special artifacts category we include artifacts that were not identified in the preliminary classification done during fieldwork, such as figurines, axes, and whistle figurine fragments. We also take into account others that Mesoamerican archaeologists might have been able to recognize its use during pre-Hispanic times. The aim of this category lies in the correct registration of the artifacts recovered on field, so we avoid names that could condition the function of an artifact. 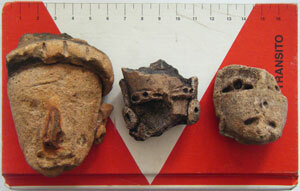 The figurine analysis will consist of the description of morphological characteristics. This will allow us to accomplish a typological identification and therefore their chronological place. Among the events that took place last week, we received a visit from Mitsuru Kurosaki Maekawa, a yokes specialist. He began the analysis of three yoke fragments from El Carrizal and La Balsa. He’ll come back at the end of this month to continue observations. We are confident he’ll provide very intriguing results about this fascinating topic! In the meantime, we’re celebrating on September 16 the 199th anniversary of the Independence of Mexico!!! This entry was posted on Wednesday, September 16, 2009 at 12:21 pm	and is filed under English. You can follow any responses to this entry through the RSS 2.0 feed. Both comments and pings are currently closed. Congratulations! This is a very interesting set of posts on an important project. I especially like the idea of getting the local community involved. However I agree with Travis D., this site does not appear to be Olmec, at least to me, in any significant way. Keep up the good work and keep posting it. Really interesting project! I worked at 2 sites in Veracruz myself, and always have a soft spot in my heart for it. I also know Mitsuru…small world. Thanks a lot for your kind comment, Richard. Just replied to Travis’ comment, we actually never said the site was Olmec, we’ll have that fixed asap. Best regards! The Olmec mis-identification was by me in the Archaeology e-Update newsletter that we use to announce new content on the website. Sorry about that, I made a leap because the site has some Olmec materials, but you are quite right. Thanks for your positive comments. 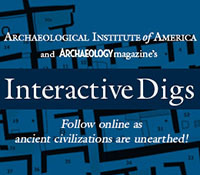 We, at Archaeology, are very pleased to be able to feature this site and the work of Natalia Donner and Jonathan Hdez. Arana. Another good article you post here.I m waiting for others to share it with my friends. A nicely written piece, informative, coherent and intelligently put forward, respect due for a welcome relief from the usual dross I find on the internet, I will be watching out for more of your posts. 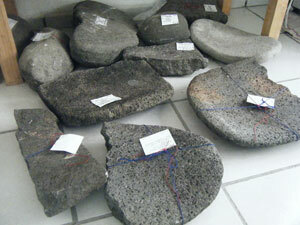 All images showing archaeological evidence belong to the Instituto Nacional de Antropología e Historia (INAH). Its use without INAH's permit is prohibited. All images courtesy Proyecto Arqueológico El Carrizal unless otherwise noted.